TomTom Telematics is launching its new TomTom PRO 2020 driver terminal, aimed at large fleet operators running cars or vans. The new solution uses reporting provided by TomTom’s WEBFLEET fleet management service but also includes forced driver ID, digital logbook to capture business and private mileage, working time log and the OptiDrive 360 driver performance improvement module – marking the first time these features have been combined in one unit. “Owners of large fleets often find connecting all their vehicles can be challenging and expensive. 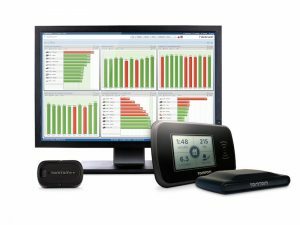 Including only essential functionality in one device, the TomTom PRO 2020 provides fleet owners with a quick and easy solution to this problem,” said Thomas Schmidt, managing director at TomTom Telematics.